Rannoch moor is always stunningly beautiful even in less than remarkable weather. During the winter the weather can be even more unpredictable but should the light and conditions materialise then the high moorland plateeau can be one of the most beautiful places on the planet. 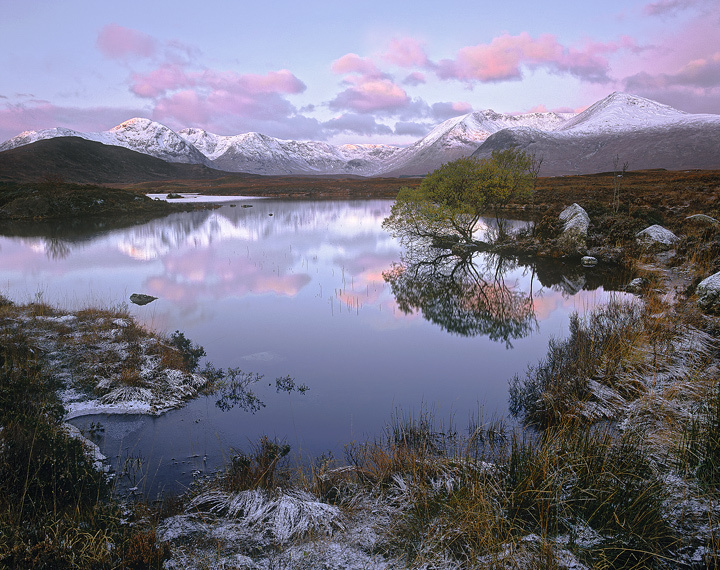 Snow dusted the perimeter grasses and heather of this small lochan and amazingly the little tree that stands at the end of the point resolutely maintains its greenery which is duly reflected in the still waters. Its dawn and as the sun climbs the lower clouds start to pinken and dapple the sky which is made doubly effective reflected in the pool.